Neil Marshall directs David Harbour and Milla Jovovich in this comic book reboot. It's gotta be tough for director Neil Marshall as the director of the reboot that no one really wanted. Mike Mignola's Hellboy comics have already been very successfully adapted for the big screen twice by the auteur du jour, Guillermo del Toro, who stumped for a third part of his series for years before he finally gave up and moved on. The property, however, was determined to soldier on, this time with comic book writer Andrew Cosby on the script and Marshall in the director's chair. They had incredibly big shoes to fill, and I'm sad to report that there was way too much wiggle room in those toes. 2019's Hellboy is a complete reboot of the series, with no connective tissue in terms of talent, but still pretty slavishly adherent to the comic roots. In this version, Hellboy (Stranger Things' David Harbour), a spawn of Hell conjured by Nazis in a last ditch effort to turn the tide in WWII, is still the primary weapon of the BPRD (Bureau of Paranormal Research and Defense), the organization that protects the world from monsters, witches, ghosts, and other ghoulie things. He's kept in line by his "father," Professor Broom (Ian McShane), who helps focus Hellboy's enormous power in the right direction. In this case, that direction is toward an ancient sorceress, Nimue (Milla Jovovich), The Blood Queen, who is determined to unleash dark forces on the human population of Earth and claim it for her own. Hellboy is not alone, though he often wishes he was; he is joined in this mission by a couple of helpful sidekicks. First up is Alice (Sasha Lane), a seer who is able to use her clairvoyant (and other) abilities to keep herself and her company safe most of the time. Then there is Ben Daimio (Daniel Dae Kim), a BPRD operative with a few tricks up his sleeve. Together, the three attempt to hunt down the Blood Queen before she can set her cataclysmic plan in motion. In other words, pretty much the standard 'end of the world' stuff that the other two Hellboy films did. So far it doesn't sound too far away from the formula that made the previous adaptations so successful, and while I hate to compare one film to another, in this case the film practically begs us to do so. The main problem, and the one thing that any film must get right if it has any hope of being successful, is the script. Cosby's dialogue just doesn't work and wanders back and forth between clumsy exposition, ill-timed and executed witticisms, and old-fashioned hokey delivery. On top of all that, there is very little emotional groundwork laid for Hellboy, and as a result, most of his adventures feel like video game battles without any consequences beyond the immediate. Fans of the comic book series will be greeted by a few familiar elements and characters not found in del Toro's version of the story beyond the characters mentioned above. We also get appearances by fan favorite Lobster Johnson (Thomas Hayden Church really giving it all he's got in his few minutes on screen), the ancient Slavic witch Baba Yaga (performed in part by horror movie contortionist extraordinaire "Twisty" Troy James of The Void), and a very emotive giant pig beast named Gruagach (Stephen Graham). However, even this bit of fan service isn't enough to save the film from its utter lack of focus and poor execution. Marshall, a director of some of the 21st century's finest genre cinema (The Descent, Doomsday, Centurion) and lots of big ticket TV (like almost every Game of Thrones episode with large-scale battles), was brought on as a veteran of big screen, big action, high-concept features. One of the main reasons Marshall was tapped was the production's intent to create a big, nasty, hard R-rated feature with all of the gore fans had been clamoring for. Marshall is no stranger to the red stuff, especially with the gruesome cannibal antics of Doomsday -- a theme that is revisited often in Hellboy -- but the main problem here is that nothing feels very real. Hellboy is clearly a fantasy, so I'm under no illusions that we are meant to believe that this world actually exists. But the film doesn't even attempt to place itself in a universe in which this could happen, and that's a problem. A large chunk of what Marshall has brought to the table in past projects is an understanding of what horror fans want, and what we want is practical effects, which the director has delivered in most of his earlier work to great success. For some reason, however, it seems as though 95% of Hellboy is computer generated, and not in an even remotely passable way. I found myself reminded on more than one occasion of Stephen Sommers' disastrous Van Helsing, both in terms of tone and CG execution, which is not a good point of reference. While Hellboy's aspiration to create a gory, gruesome, hard-R film is definitely achieved, none of it has any substance or emotional impact, because it all looks incredibly fake. It's not unlike the unfunny love-child of Van Helsing and something like Olaf Ittenbach's The Burning Moon: brutal, insane, often even creative ultraviolence perpetrated on unwitting and underserving citizens for the entertainment of the masses. Let me assure you, as a gore fan, I'm in no way opposed to mean-spirited evisceration on screen, but when it looks this bad, I must draw the line. It seems like the only significant element of this wild fantasy that was done using practical makeup was Hellboy himself, and he looks great, so to waste that kind of talent in lieu of videogame cut-scene level animation is criminal. Even worse is that the film seems blissfully unaware of how bad the VFX actually are, as evidenced by an extended monologue given during the climax that looks spectacularly bad; like, Jib-Jab bad. It's a pity, because the property has so much great history to draw from, but perhaps in their haste to differentiate themselves from del Toro's largely hand-crafted, tangible worlds, they went too far in the opposite direction. 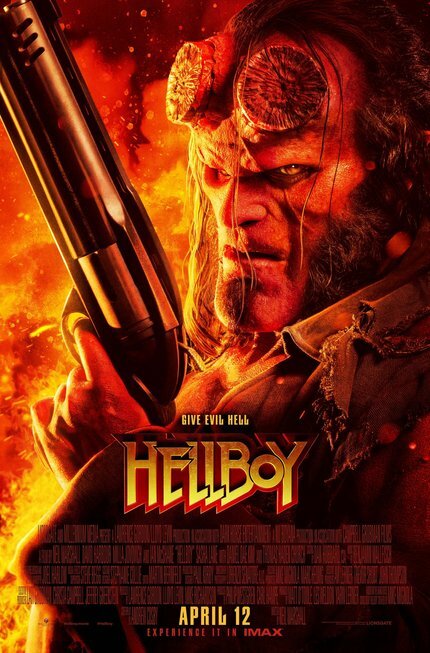 This Hellboy is the kind of film that, even though you know it's not good on any significant level, you almost have to feel sorry for a lot of the people involved. Harbour's performance doesn't have the same kind of affable charm that Ron Perlman brought to the character, but he does fairly well with the material he's given, and on the odd opportunity he's gets to emote, he acquits himself well. Marshall delivers the kind of brutal ultraviolence that he was expected to bring to the project, but the lack of weight of any of the character's decisions and the overuse of shoddy CG in implementing the carnage undermines everything. I am obviously a fan of the early adaptations of the Hellboy story, so this film was starting at something of a disadvantage. However, I went in expecting to enjoy myself, I wasn’t immediately turned off by any of the promotional material, and the involvement of Harbour and Marshall felt encouraging. It just feels like the final product was the result of too many compromises in weird places. Maybe not enough time? Not enough money? I don’t know, and in the end, it doesn’t really matter. We are where we are, and where we are is just disappointing. A New HELLBOY Movie? With STRANGER THINGS' David Harbour, Directed by Neil Marshall?